Only 55% of Australian patients are on optimal lipid-lowering therapy in the year after a heart attack, say researchers. In a retrospective analysis published in the Medical Journal of Australia, researchers found that 45% of patients hospitalised for acute coronary syndrome (ACS) were not receiving intensive lipid-lowering therapy, as recommended in most clinical practice guidelines, at six to 12 months’ follow up. About 24% of patients were receiving some form of lipid-lowering therapy, but not intensive therapy, and almost 22% of patients were not on any lipid-lowering therapy. Lead researcher Professor David Brieger, Professor of Medicine at The University of Sydney’s Concord Clinical School, said intensive lipid-lowering therapy was key in reducing the risk of subsequent coronary events in high-risk patients. The researchers evaluated data for 3441 patients enrolled in the Cooperative National Registry of Acute Coronary care, Guideline Adherence and Clinical Events (CONCORDANCE) in 2015-2016. 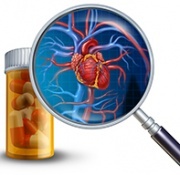 Intensive lipid-lowering therapy was defined as treatment with: atorvastatin (40 mg or more daily), rosuvastatin (20 mg or more daily) or simvastatin (80 mg or more daily), with or without ezetimibe; lower intensity statin therapy with ezetimibe; or ezetimibe alone. About one in five patients was discharged from hospital without a prescription for intensive lipid-lowering therapy, and this was the leading predictor for not being on therapy at follow up (odds ratio [OR], 7.24). Other predictors of suboptimal therapy at follow up were not taking intensive lipid-lowering therapy before hospital admission (OR, 1.53) and being a woman (OR, 1.20). Professor Brieger said it was not clear why some patients were discharged from hospital without being prescribed intensive lipid-lowering therapy, but physician error, patient intolerance and patient refusal were contributing factors. Med J Aust 2018; doi: 10.5694/mja2.12035.